Color Picker samples color/value information from a single pixel to give a precise readout of a specific location. Great for matching multiple cameras or getting consistent exposure in changeable lighting conditions by sampling from a color chart or an actor/subject's face. The Color Picker is easily placed anywhere on the image using the joystick or tapping on the touchscreen. Making judgements based on the data will depend on the user's preference. 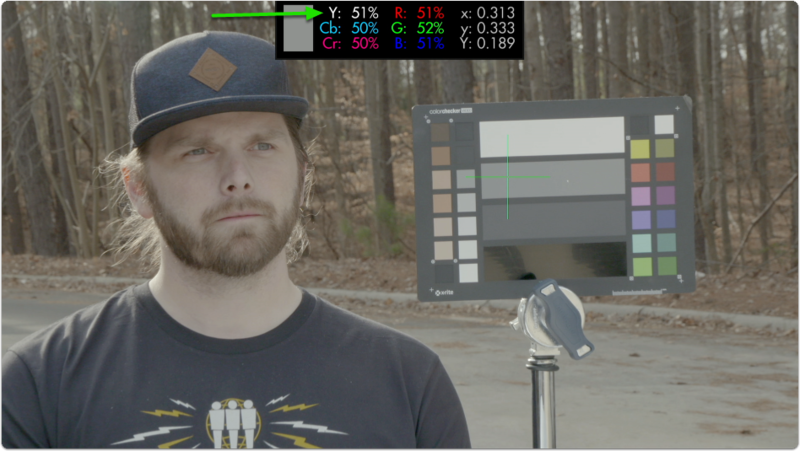 An example use case for the color picker is placing the sampler on a mid grey card before every take during changing weather conditions. Roll exposure to keep the values matched for consistent exposure throughout the day. Speed is not where the Color Picker shines for setting exposure if you need to keep an eye on several areas simultaneously - for the fastest exposure tools we recommend Zebra, Exposure Assist or the Waveform if you prefer a scope. 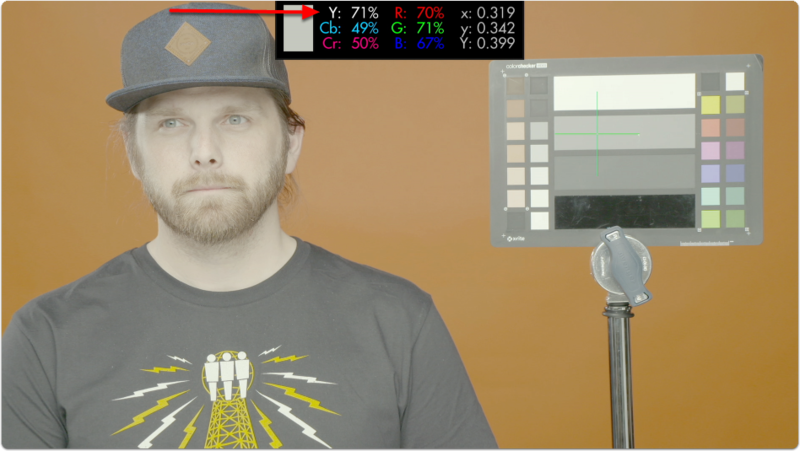 The Color Picker serves exposure decisions that can be made from a single point such as a human face or a color chip on a test chart. To gauge a slightly wider area, have a look at the Spot Meter function of the Waveform. The Color Picker displays only a crosshair and a popup containing some information on the pixel that's being highlighted so it keeps a relatively low profile, allowing other imaging decisions to be made without too much on-screen distraction. 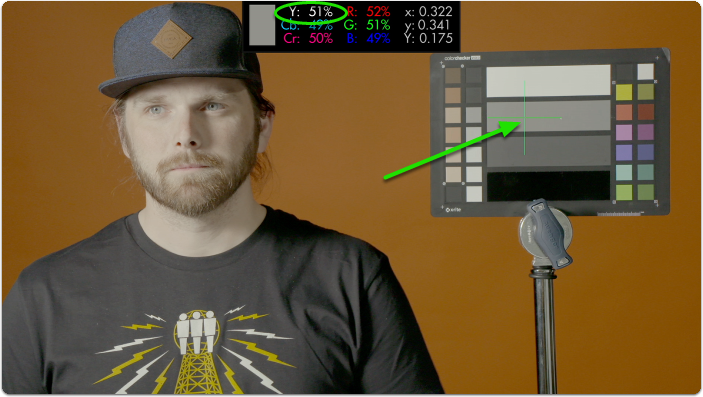 In this section we will add a Color Picker to a page and use it to set exposure in differing lighting conditions using a calibration chart. From any page with a video feed, click the joystick or tap the screen to bring up ‘Add New Tool’. 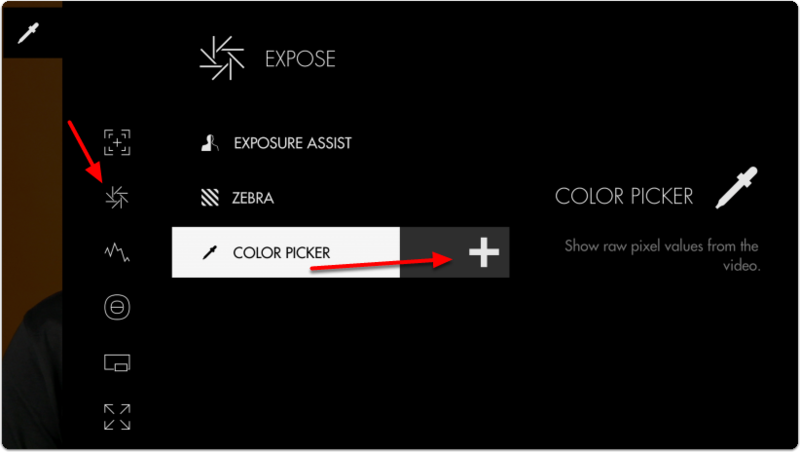 Navigate to Expose > Color Picker and select to add it to the current page. A stats window and crosshair populate the window; if we move the joystick or tap the screen we can change the point currently being sampled. The Color Picker is unique in that it doesn't remain active when not in use, meaning when the tool is activated, moving the joystick will move the crosshair around the image and not flip through pages. To freely move between pages, disable the Color Picker. Set the crosshair on a point on the image that you wish to get a precise reading from. In my case I will pick the middle grey chip on an X-Rite ColorChecker Video chart. This enables us to set consistent exposure shot-to-shot, resulting in less work fixing levels in post. This particular color chip has been designed to read as 'middle grey'. Look for the 'Y' (luma/brightness) percentage and roll exposure until it reads near 50%. To compensate all we need to do is roll (close) the iris until we get back to the same value from before. 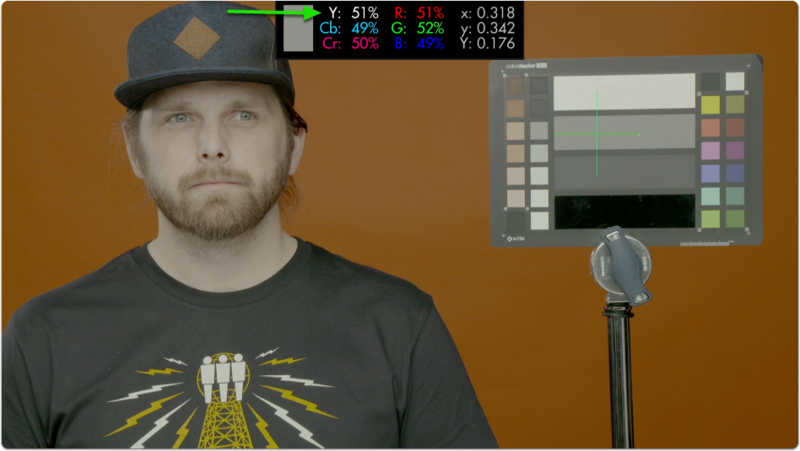 Using the same technique we can adjust for exposure under any lighting condition and arrive at a clean result that will give us consistent, gradeable footage! Access Color Picker tool settings menu by navigating right or pressing the right arrow when Color Picker is highlighted in the tool list. Choose how you wish to display brightness ranges - via percentage or raw image value which will change depending on bit depth (8-bit is 0-255, 10-bit is 0-1023, etc). Set the location of the on-screen display to a spot of your choosing for best readability or to make room for the crosshair itself. Adjusts the color of the crosshair for easier viewability. Adjusts the speed at which the color picker crosshair will glide across the screen when moved with a joystick.